Above situations are not an effort to give you a reminder of your daily activity and neither a tip-off to get away with a long queue. But instead to give you a ride through the channel of your daily thought process. Also, you might be amazed why the word “locked” is there. Human brain is designed for performing and memorizing daily tasks in a particular manner. All the above tasks are revised daily by our brain in a way that we subconsciously “lock” these tasks and forget about it. These tasks involve critical thinking. But there is another facet of our brain called “lateral thinking” that is less prominent or explored. This does not involve locking tasks into subconscious mind but unlocking the madness of imagination. For that, you have to step sideways from your regular thought process and view a problem from a 360-degree angle. You should enjoy this live demo of what lateral thinking is. Take this example - What has four legs, but can't walk? There you go, you are now thinking lateral--- the answer is “Table” anyways. We share same intelligence the only difference is some like to reach the end of the horizon while some shrug their shoulder saying “no way”. Limiting oneself to boundaries is a blockage to lateral thinking. Without lateral thinking there won’t be names existing like Einstein, Newton, Edison OR Pizza, Pastries and Pokemon go. “Lateral Thinking” is like flashpoints that spark innovative ideas in a critical situation in most cases to find the solution. It is largely based on individual’s ability of permutation and probabilistic forecasting. It gives options to take a lesser wrong decision if not correct. Business failure and success are oriented on these decisions. 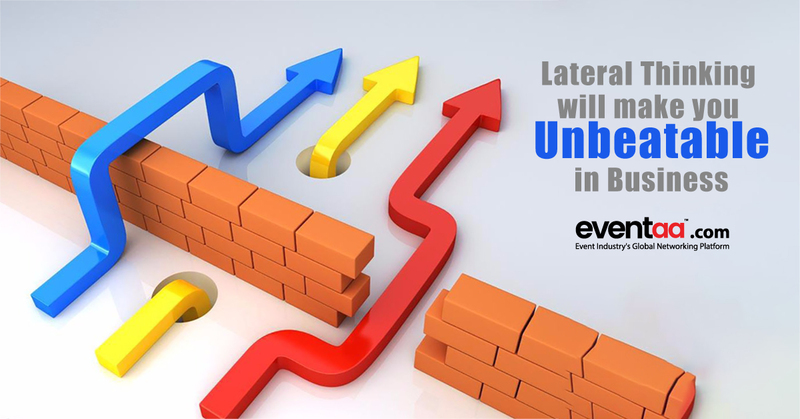 Exploring new dimensions in business and eliminating existing obstacles demands lateral thinking. The great philosopher and Professor- Dr. Edward de Bono has proposed the theory of “lateral thinking” and many business peers advocates his ideology strongly. You are familiarized with the word “Business Acumen”, it is nothing but an ability of a business person to think “Out of Box”. Business can flourish if there is a continuous improvisation and implementation of innovative or new ideas. Our brain is our think-tank that we frisk sometimes to find ideal solution. If you turn pages from history, all great business models are the production of lateral thinking. Take example of “Apple”, when most users were accustomed to MS windows, “Steve Jobs” decided to leap a step further and developed its own interface that was unique and captivating. All business leaders are good at taking risk and even better at ideation. Finding needle in the haystack is the fundamental characteristics of lateral thinking, it is this trait that can sweat your business competitor. So what are the proven methods for applying lateral thinking to make your business successful? To understand this let’s check. What Dr. Edward de Bono theory says? According to Dr. Edward de Bono theory, you can put “Six Thinking Hats Model” for lateral thinking, each "Thinking Hat" represents different style of thinking. Let’s see this from Event perspective. · White hat: Learn from your previous experience. Most people use this approach for their problem using facts and figures from past and present. For instance, an Event planner checks whether the existing event will complete at a given time by calculating and comparing past event data with the current data. · Red hat: Believe on your gut feeling. Sometimes you only have the option to believe your sixth sense or premonition. If an event looks too gloomy due to dull lights, event managers will take a decision based on his gut feeling on how many lights might be required and where it can be placed for better illumination. · Black hat: Use defending demeanour. Contemplating situation from the negative point of view or consequences is a fair deal. What if there is a stormy wind that rips off your Event tent, do you have a backup plan to fix it? · Yellow hat: Think positive. Remain optimistic and taking decision in an unfavourable situation is a good sign of event managers. In conditions like stringent budget or time, you have to use available resource to the fullest and do best with whatever within your reach and stay positive. · Green hat: Propose a creative solution. Dilute your thought so that it can bring creative ideas or solutions to a problem. · Blue hat: Two Is Better Than One. Take other people’s perspective in consideration, especially peers. If ideas are running out its better to interlace your views with others, for sure, you will strike ideas before the dusk. Observe objects around you with great details like shape, dimension, colour, and so on then try to mishmash or interconnect them with each other. Prepare a hierarchical tree around issue, and sketch a possible solution as branches to it. Put yourself in other’s shoes. Think on an issue and visualize how a particular person or peer will react to it. Compare your problem with a symbol, legend or story. Try to apply their solution to your problem. Sit in a circle with your colleagues or friends, write your idea or solution on a paper, then pass it on to each individual and ask them to do the same. Sometimes the idea pops out from the most unexpected source. While reading books or magazine you can draw inspiration from stories or pictures. It can lit up your neural pathways to brighten some obscure areas. It is quite possible that you have ignored your lateral brain hunch owing to fear of rejection or embarrassment. Here, you have the opportunity to express your madness that you think is “Out of Box”. Let’s go crazy!